Police have recovered a shoplifter’s shopping list of goods to steal for customers. 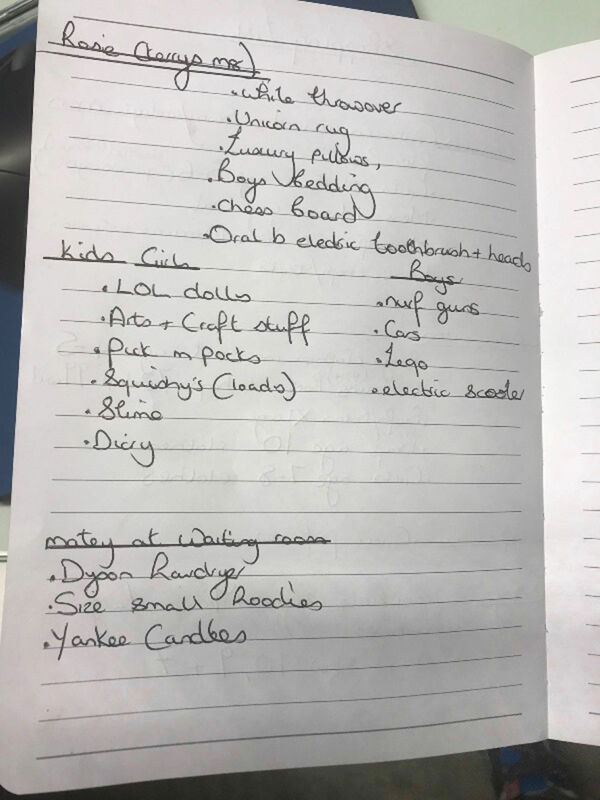 The wish list was recovered from the handbag of the known shoplifter in Swindon town centre in England after security guards attempted to stop her stealing from Debenhams. One customer, called “Colleen”, wanted girls’ clothes aged five to six, a men’s medium grey coat and lamb chops/steaks. Another pair of associates, known as “Tall P and Tasha”, were after Gucci perfumes while “Jimmy” wanted medium and large tracksuits, men’s trainers in sizes 7, 9 and 10 and aftershave. Other items listed to be stolen included a Dyson hairdryer, an Oral B electric toothbrush, “luxury pillows” and Yankee candles. Pc Paul Bezzant, of Wiltshire Police, said: “These lists are obviously for people who have ordered goods to be stolen. “They feature names or nicknames of recipients along with the places where they hangout or have agreed to meet the thief. “We are aware of this problem in Swindon and are working with our partners to stamp this out.